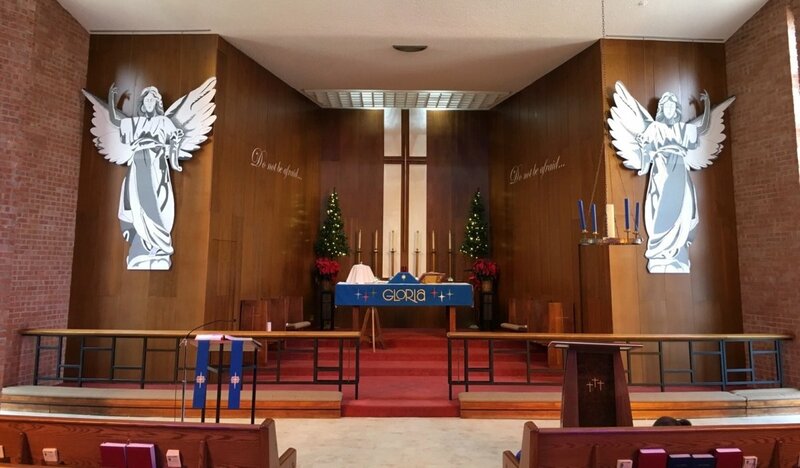 For the last several years I have participated in our church's "Liturgical Art Team," charged with the task of decorating the altar and sanctuary for the major holidays in the church year, most notably Advent/Christmas and Lent/Easter. This article is a continuation of the series of hubs I have written to document our process and to (hopefully) inspire others to pursue similar projects in other houses of worship. I am an artist, but my fellow team members come from all walks of life. The only prerequisite for doing this work is a love of the Lord and a desire to enhance the worship space in a meaningful way. The pen and ink drawing above is one I created while thinking about the design for this year's Advent/Christmas display. I wanted a clean, classic design that embodied the concept of God's enduring love and desire for relationship with his people, Naturally, angels embody this description completely, as they act as messengers from God throughout scripture. 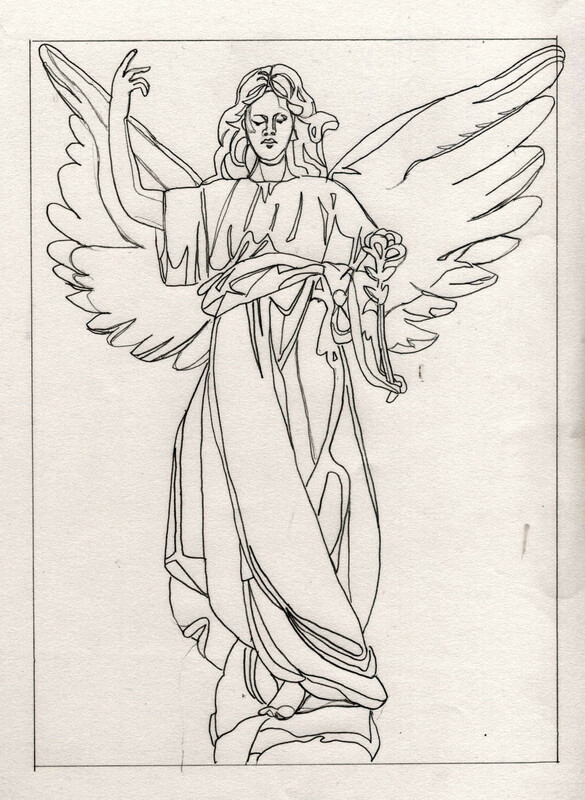 An interesting note about this drawing is the rose this angel holds, The rose is a symbol for God's interaction with humankind, so I was happy to include this rose in my drawing. I also knew I wanted to limit our palette for this display, Our previous year's design was very vibrantly colored (see my hub, "Decorating the Church and Altar for Advent and Christmas, Volume 3") and I wanted to strike a different yet equally beautiful note this year, For this reason, we decided to execute our design in only black and white and shades of gray. This, we thought, would give a peaceful, uncluttered look to our decor. These two sketches were shared with the rest of the Liturgical Art Team to get their feedback. The response was positive, so plans for production could begin. One of the beauties of this digital age is that all of this part of the process could be done over the internet in a matter of minutes. It's important to note that these conversations took place in early August. I can't stress enough the importance of giving your team plenty of time to implement their plan. Unforeseen delays happen with almost every large project, and you do not want to come up short. This project was a perfect example of this circumstance, which I will describe later. 3. we have a church member who works at a cardboard company that creates all shapes and sizes of cardboard components for packaging. 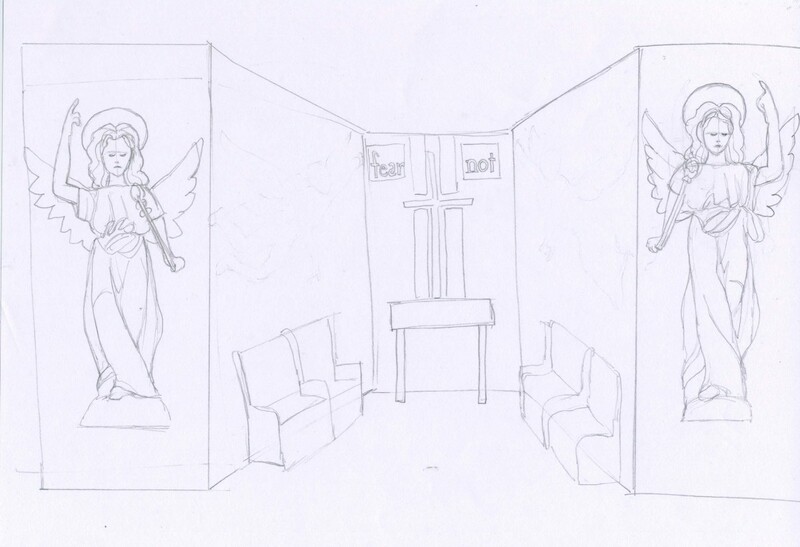 In fact, this wonderful company offered the cardboard we would need for free along with cutting the shapes of the angels to our specifications. 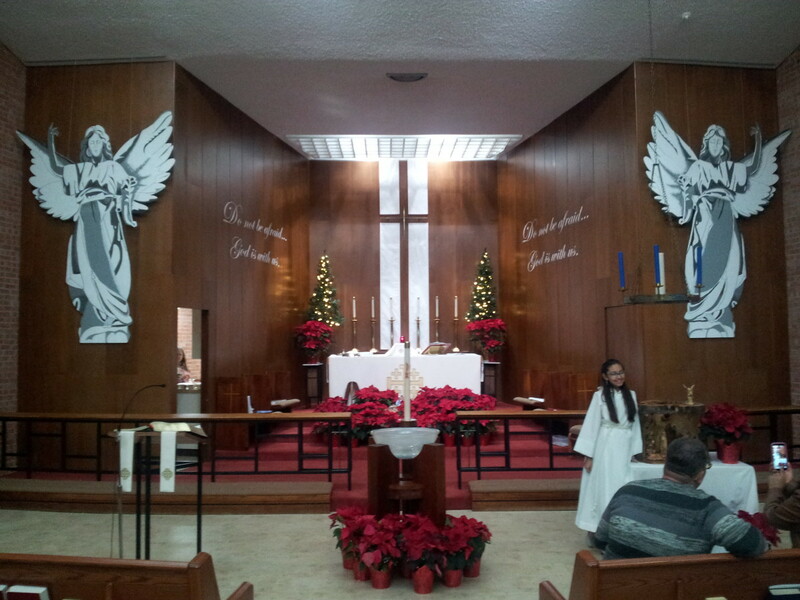 Due to the size of the angels, they had to be fabricated in pieces as seen in the photo above. We also decided to paint our designs using acrylic house paint mixed in our various shades. We were able to use just the sample sizes of paint and had plenty of paint to spare. In order for the acrylic paint to properly adhere to the cardboard, several coats of gesso were painted onto the cardboard. Once this gesso layer was dry, the drawing could be transferred and final painting could begin. To get the drawing transferred to the angel cut-outs, our team usually relies on the tried-and-true method of projecting the image from a distance to enlarge it to the size required. 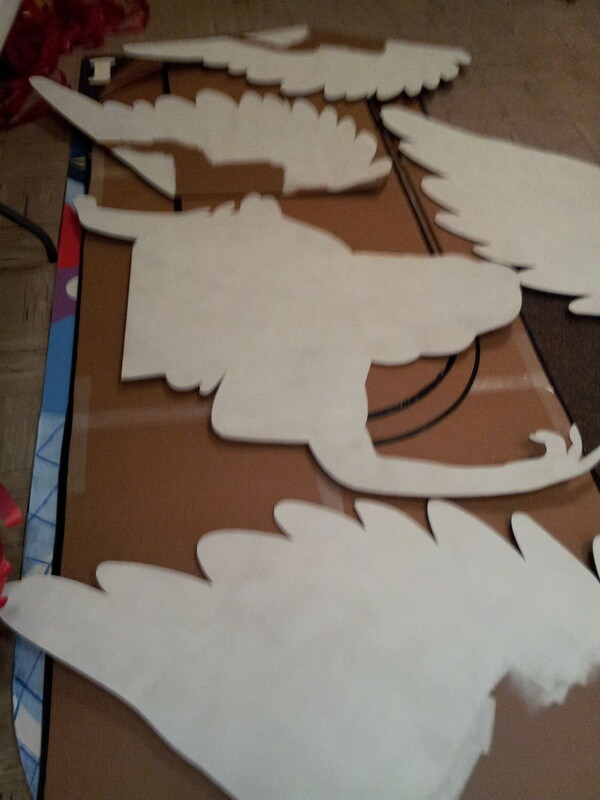 Because we were running short on time, we decided that I would draw the angels directly onto the gessoed cardboard. This saved us lots of time. If you don't have a member with this kind of drawing skill, you will probably have to rely on the projection method. Which brings me to the story I promised about unforeseen delays. 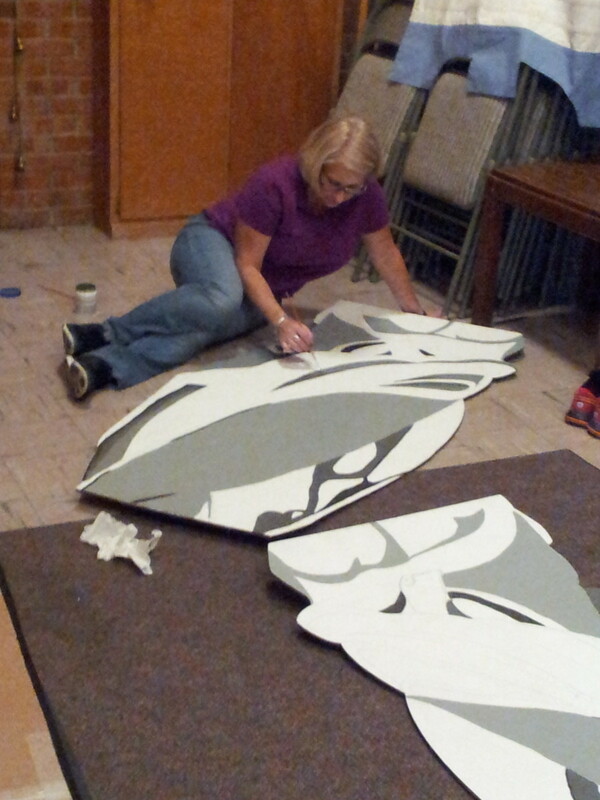 The cardboard company offered to cut the shapes we needed on their specialized equipment, which we happily agreed to. They are a business, of course, so paying customers get priority. 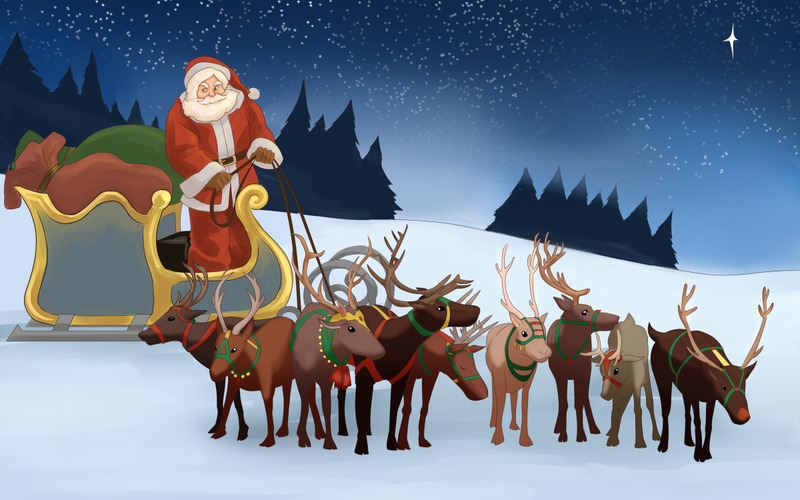 Therefore, our project had to wait quite a while before it could be done. As a result we had a bit of a rush at the end, but we were able to finish with plenty of time. To help our painters understand where to paint and what gray paint to use, I made "paint by number" sheets to use as a guide. Our jars of paint were numbered from one to five from light to dark. I made five copies of the original line drawing and made a "map" for each color as a guide for our painters. 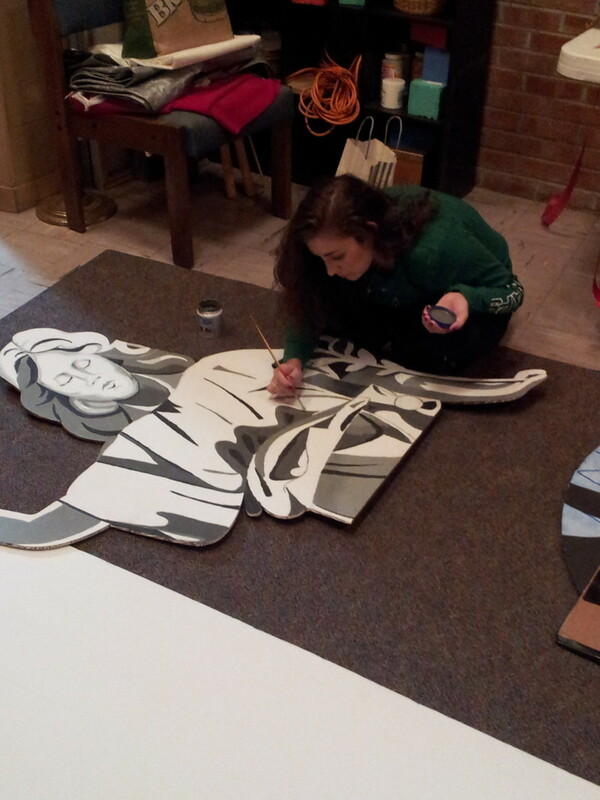 Once we had the angels painted, it was time to construct them. This was accomplished by gluing the cardboard pieces onto a corrugated plastic backing (the kind of material many signs are made of). This backing provided an extra element of rigidity the cardboard needed, as it had a tendency to want to curl. 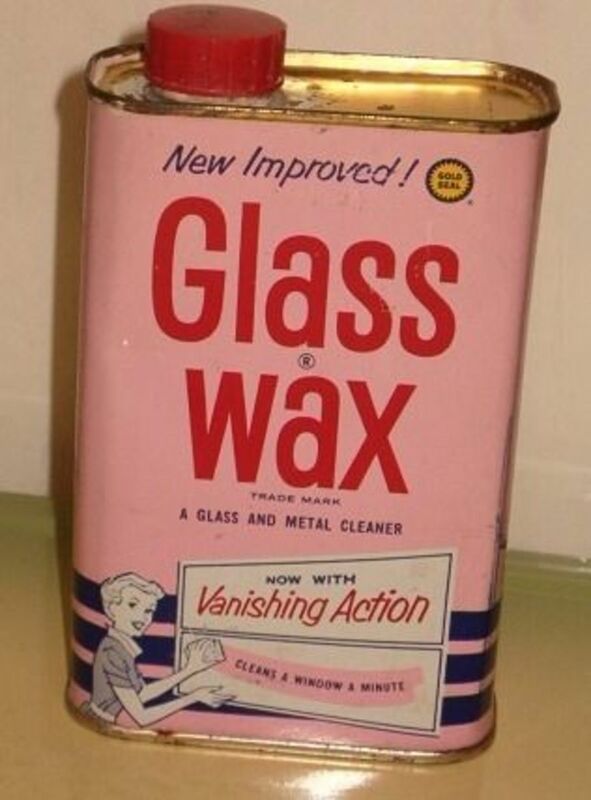 The plastic backing was adhered to the cardboard using "Gorilla Glue" and lots of weight. This weight came from stacks of hymnals - very appropriate! Grommets were inserted into the plastic backing at the angels' shoulders to attach the hanging wires they would hang from while on display. The angels were then hung from a hanging system installed in the ceiling. 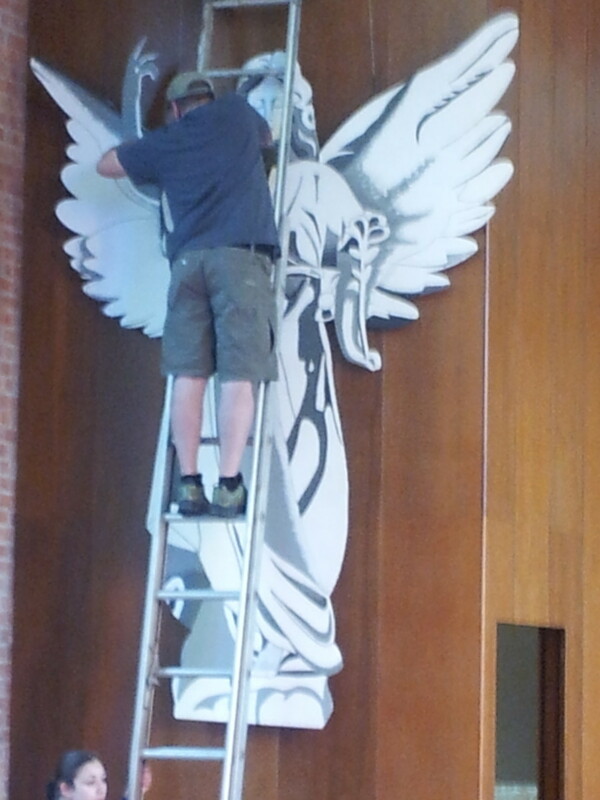 Then, as a final step, the angels were checked for level and anchored to the wall at the bottom with Command Strips. 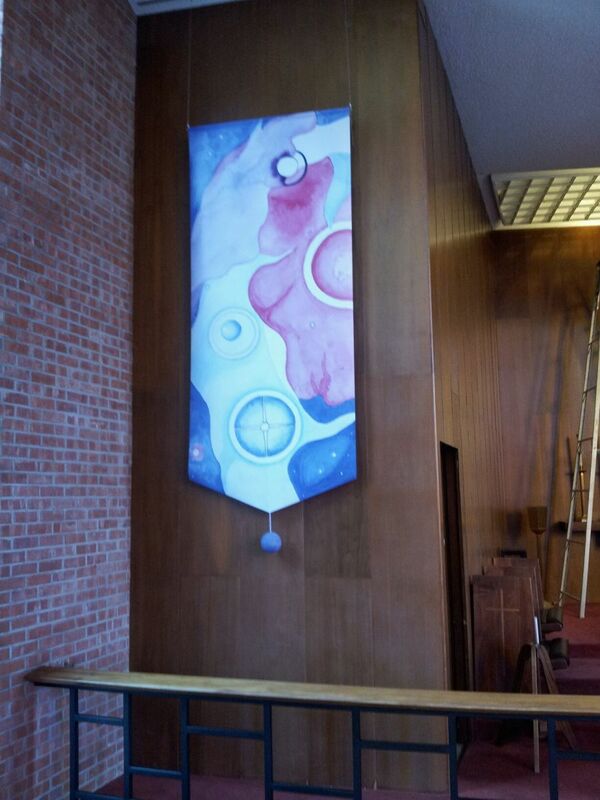 We anchored the angels at the bottom to allow communion servers better access to the communion rail. As a part of the display we wanted to include Isaiah 41:10, "Do not be afraid, God is with you." 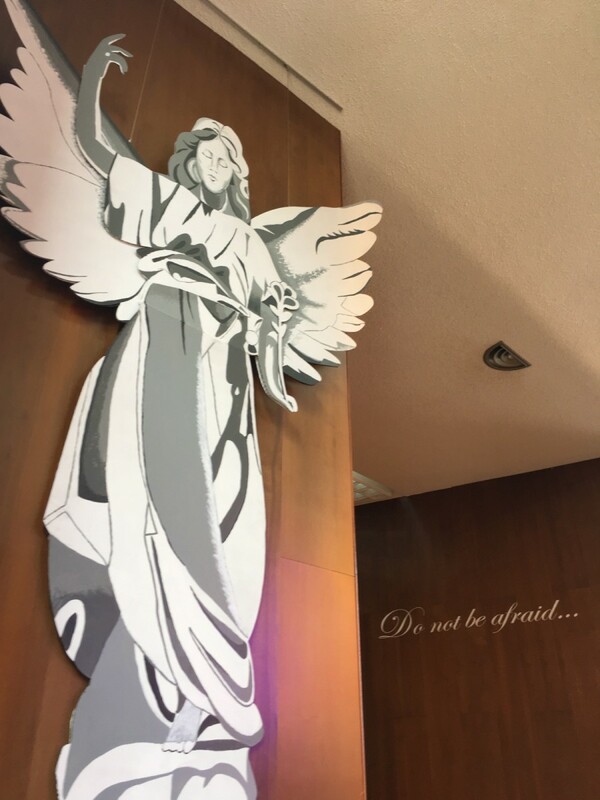 We decided to put up "Do not be afraid" when the angels were first displayed on the first Sunday of Advent. Then we added "God is with you" for the Christmas eve service. These words were created by a company that makes adhesive signs using an elegant font. The letters were made white to help them stand out against the dark wood paneling and to match the coloring of the angels. The words were easily adhered to the wall with the only challenge being getting them evenly spaced and level. 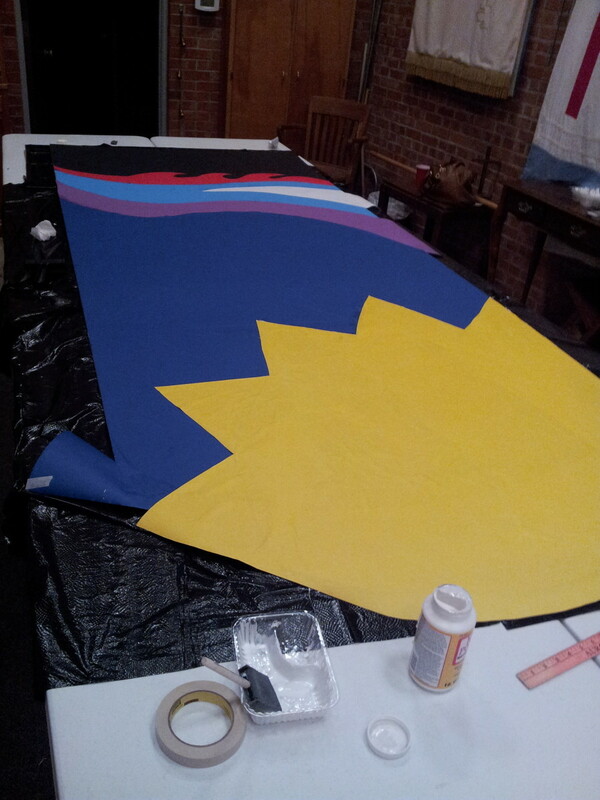 This project was a lot of work and, at times, frustrating. We faced delays and struggles getting the angels built and displayed to our satisfaction, but (as always) we persevered and saw the project through to a great final product. In spite of all our frustrations and worry, our display ended up being one of our best. 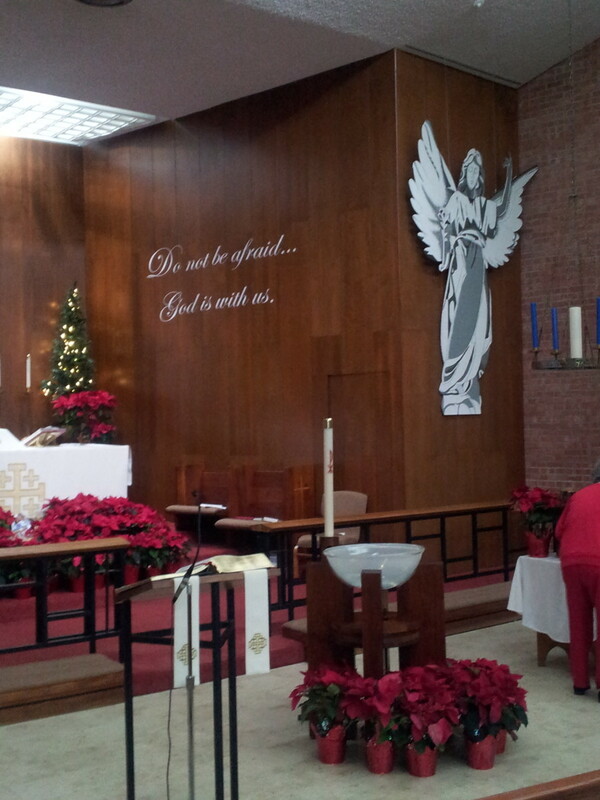 Decorating the church for the holidays is always rewarding, sometimes especially because it is hard to do. I hope you will consider going to this effort for your church. It is a wonderful way to express a reflection of God's love for us. Wow, those angels are amazing! 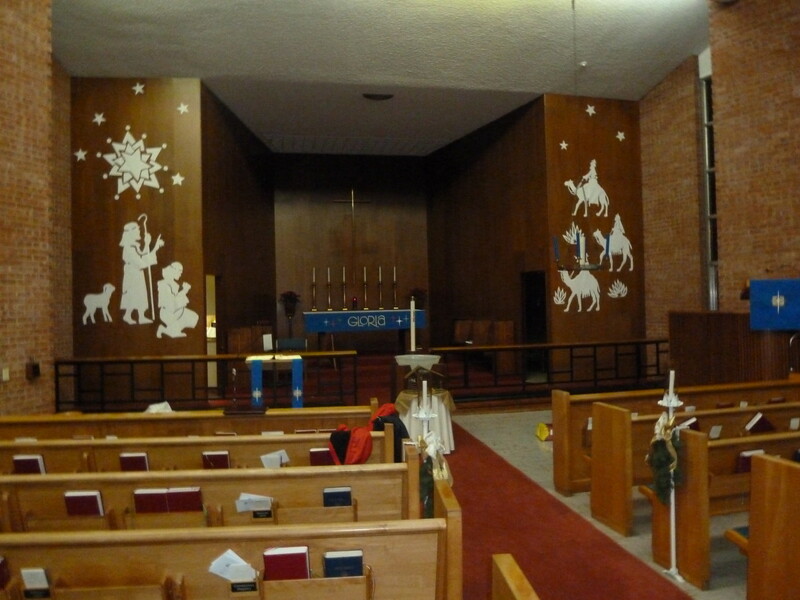 I can't believe they are made of cardboard, they look really awesome from the pews. Great job with those darks, it makes them look 3D.